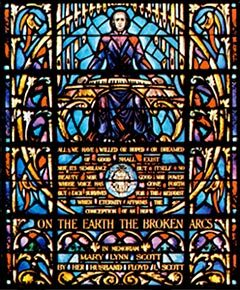 The central double window in the Martin Entrance Foyer represents Robert Browning's poem "Abt Vogler," which he subtitled "(After He Has Been Extemporizing Upon the Musical Instrument of His Invention)." It is about an actual eighteenth-century organist who was famous for extemporizing. Abt Vogler created his music at the spur of the moment as he sat at his instrument and played. The poem is a soliloquy, with Abt Vogler talking to himself as he has finished playing. He describes the music just created as a structure--like a beautiful palace--that he builds around himself. He knows that once he takes his fingers from the keyboard his palace of sound will vanish; and he wishes that, like a true palace, it could last forever. The lower portion of the window illustrates this scene beautifully. Above Vogler's crest is seen the musician seated at the instrument of his own invention, building the palace of sound around himself as he plays. The circle or arc surrounding him is broken in several places. This suggests that nothing is complete, perfect, or lasting in mortal life ("On the earth the broken arcs"). Vogler's consolation as he mourns his lost music is his belief that, "All we have willed or hoped or dreamed of good shall exist . . . when eternity affirms the conception of an hour." In other words, all good things will be made eternal by God. In the upper portion of the window is the symbol of the Palace of Sound ("rampired walls of gold as transparent as glass") and the "perfect round"--symbolizing the perfection and permanence to be found in heaven. Within the circle stands the figure of creative music in silvery white. The radiating gold star on a field of blue is the symbol of harmony ("That out of three sounds he frame, not a fourth sound, but a star"). 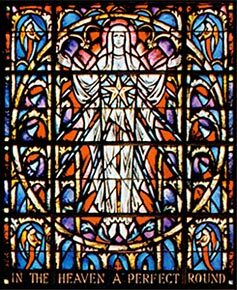 Musical angels adorn the corners in both segments of the window. Excerpts from Robert Browning's "Abt Vogler"
that made them and, lo, they are! not a fourth sound, but a star.